Lithographic equipment are widely employed for printing complex circuit patterns on silicon wafers that are mainly raw materials for integrated circuits (ICs). Printing process is considered to be one of the most expensive and critical steps in wafer fabrication. The IC industry is therefore focused toward using lithographic equipment as cost-efficient enhancements in the production technology. Following expansion of electronic device industry, demand for semiconductor IC for application in different areas such as sensor devices, memory devices, communication, and consumer electronic devices has witnessed a tremendous surge. This has further created the need for cost-efficient and effective printing equipment of IC production such as lithographic equipment. In addition, proliferated adoption of compact electronics and large panel displays has further led toward demand for KrF and ArF lithographic equipment. The movement toward new innovations in Lithography, which include 450mm wafers and EUV technology, has entailed new challenges as well as opportunities. With the evolution of the semiconductor and electronics industry, companies are seeking improvements that would have the potential to realize future technology. Manufacturers of lithographic equipment are focusing on gaining more experience and expertise for effective fabrication of the new innovative chips. However, digital printing has been consistently gaining ground on the lithographic equipment market since the recent past, and has closed in at a point wherein it is on the brim of dominating the IC production. On the other hand, higher cost per sheet of digital printing compared to that of lithography equipment will remain a major factor hindering adoption of digital printing technology for semiconductor IC fabrication. According to Transparency Market Research, a splendid expansion at over 15% CAGR will be reflected by the global lithography equipment market during the period 2017 to 2026. Approximately US$ 640 Mn revenues are forecast to be gained from sales of lithographic equipment across the globe by 2026-end. With the presence of a large number of leading lithographic equipment manufacturers, along with rapid rise of the semiconductor industry in Asia-Pacific excluding Japan (APEJ) have made the region to be most lucrative for the lithographic equipment market. In addition, revenues from lithographic equipment sales in APEJ will increase at the highest CAGR through 2026, followed by those in Japan. Proliferation in adoption of smartphones, in parallel with a constant rise in demand for compact electronic devices are further likely to contribute the market growth in these two regions. North America will also contribute significantly to the market growth, in terms of revenues. This can be highly attributed to surging demand for advanced ICs in the region for making innovations in products. Robust expansion of consumer electronics sector in North America will also underpin expansion of the lithography equipment in the region. The global market for lithographic equipment has been densely marked with the occupancy of prominent vendors, who hold majority share of the market. These vendors are continuously working on developing innovations in the equipment for reducing the cost per function and improving the profit margins of IC manufacturers. Key players actively underpinning expansion of the lithographic equipment market include Ultratech, SUSS, Cannon, Nikon, SMEE, Rudolph, EVG, ASML, ORC, USHIO, Orbotech, and Screen. 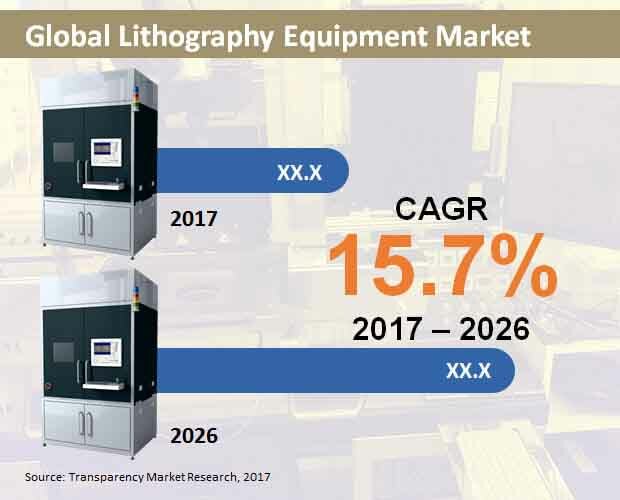 A new insightful report developed by Transparency Market Research (TMR) imparts forecasts on the global lithography equipment market. The report delivers important dynamics that affect the market expansion, coupled with the intelligence about latest market trends, influencing factors and curbing factors for growth of the global lithography equipment market. The report also encompasses an in-depth analysis on the data associated with multiple market parameters. Moving ahead, the report imparts insights on global market for lithography equipment based on segmentation-wise analysis. Characterizing the global market for lithography equipment into application, technology, packaging platform, and region, this chapter provides market numbers associated with the Y-o-Y growth comparison, market share comparison, and the revenue comparison. The global lithography equipment market is characterized geographically into North America, Middle East & Africa (MEA), Latin America, Asia-Pacific excluding Japan (APEJ), Japan, and Europe. A robust, tested & proven, research methodology is leveraged by analysts at TMR for developing the report on global lithography equipment market. This research methodology helped the analysts in giving accurate insights pertaining to the global lithography equipment market. This research methodology depends completely on the secondary & primary researches, for gleaning critical information related to the market’s future prospects. The intelligence offered is validated thoroughly by TMR’s analysts, so as to ensure its authenticity, and make the report to be an authoritative and a reliable reference for its readers.